Will & Huw were two guys who wanted to make the best steak restaurant in London — it only took a short time for Hawksmoor to become just that and with restaurants popping up all over the country, it’s fast becoming a UK-wide favourite too. We could rattle on about the mouth-watering dry-aged cuts for hours, just trust us when we say they’re something truly special. There are plenty of other good reasons to eat here too, including freshly sourced fish from the Brixham market, bought the morning of your meal, that makes the perfect surf to your delicious turf. Then there are the triple cooked chips, somehow both crispy and fluffy, the potatoes cooked in beef dripping and the puddings well worth saving room for. We’re talking peanut butter shortbread, strawberry & basil sundaes, salted caramel Rolos and much more. The drinks menu is looking pretty sharp too, with a cocktail bar that’s the envy of most fashionable spots in London and a wine list that’ll transport you to Tuscany, Australia, Provence and have you back in time for cheese and biscuits at the end of your meal. If you’re looking for a dining experience to leave you in a state of utter bliss, Hawksmoor is just that. You’ll receive a discount on your bill! 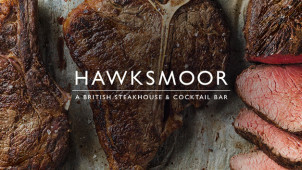 Sign up to Hawksmoor’s mailing list to hear about some brilliant offers! Can I get Hawksmoor gift cards? You can, Hawksmoor gift cards make for a delicious present to a foodie friend! Where is my nearest Hawksmoor? You can find the ever growing list of Hawksmoor restaurants on its website. Can I bring a bottle to Hawksmoor? Yes, there is a corkage charge for bringing a bottle, though on Mondays it’s just £5! Can I buy a Hawksmoor recipe book? Absolutely, if you fancy giving one of its dishes a try, head to the store. Hawksmoor opening times for each restaurant are listed on its website. When it comes to steak, you don’t want to cut corners, you want to head straight for the best — and the best is at Hawksmoor. Described as “flawless” and “tear-jerking” by The Times and “The best steak we have ever eaten” by Esquire, you’re walking into one of the country’s best steakhouses and cocktail bars when you head to Hawksmoor. Show up with a Hawksmoor voucher from vouchercloud to save on your next sirloin or rib-eye and you’ll get world-beating fare for less! The secret of Hawksmoor’s success is in British beef. Its owners scoured the globe for the best beef in the world, only to find the choicest cuts were right on their doorstep. Always fed with grass, never grain and held to the highest standards of welfare, these cows are farmed for quality, not price. Hand-butchered and dry-aged for 35 days, this care and commitment goes a long way to making this steak some of the best in the world!